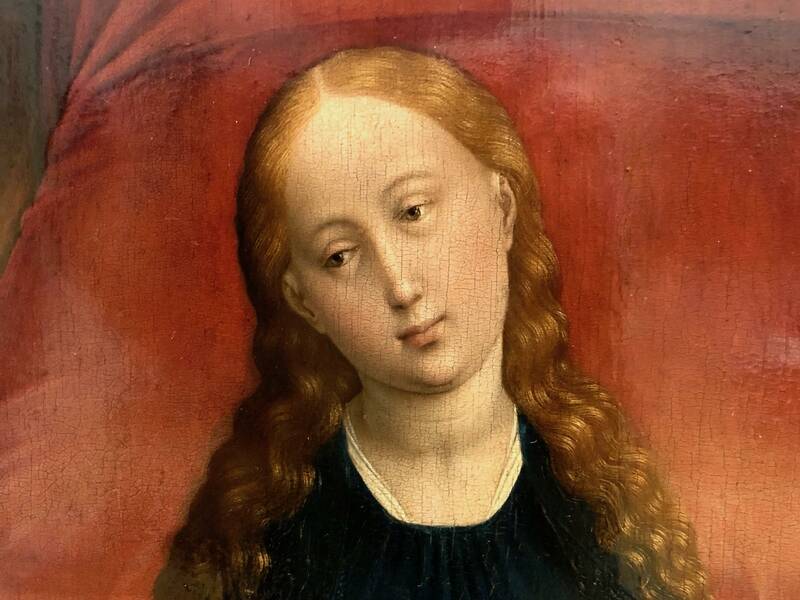 Annunciation (detail), Workshop of Rogier van der Weyden, c. 1440. I’ve written more about Advent than any other season of the Christian year. It’s like a Mahler symphony, densely packed with vivid contrasts, complex themes, cosmic grandeur, dark abysses and sublime radiance. It begins with the cymbal crash of an exploding world, and concludes with the tender adagio of a baby’s first breaths. Advent haunts our complacency, stirs our longing, and lights a brave candle in the dark. My ten previous Advent posts, divided into the categories of theology, worship and practice, can be linked directly from last year’s summary compilation, “How long? Not long!––The Advent Collection.” Whether you love the season as I do, or are wondering what it’s all about, I hope you will find in those ten posts some words to connect with your own journey toward the dawn. Meanwhile, here is something new: a set of intercessions I composed for this year’s Advent liturgies at St. Barnabas Episcopal Church on Bainbridge Island, the local parish where my wife Karen Haig is the rector. You may recognize specific borrowings from tradition, such as the ancient O Antiphons or the Book of Common Prayer, but it all comes from a lifetime of Advents, soaking up the language and embracing the themes of this transformative season. I offer these prayers for both liturgical and private use. And if they prompt you to explore your own devotional language of longing and hope, so much the better. Hear us when we pray to You. Blessed are You who join us together in the communion of Christ’s Body. Renew and energize your holy Church, in this parish and throughout the world, that we may be a resurrection people, manifesting your steadfast love in our common life of praise and service. O perfect Wisdom, direct and rule the hearts of the leaders and shapers of society, raise up prophets of justice and peace, and empower your people for the holy vocation of repairing the world. May we entrust all our labors to the work of Providence. O Deliverer, You unlock every door and make a way where there is no way. Set free all who are afflicted or distressed in body, mind or spirit. Resurrect their hope, grant them peace and refreshment, and restore their joy. O compassionate One, hold us in your mercy: heal the sick, mend the broken, protect the vulnerable, shelter the refugee, strengthen the weary, rescue the lost, and give courage to all who struggle. O Morning Star, bright splendor of the light eternal, illumining all things with your radiance: Come, enlighten all who sit in darkness, and those who dwell in the shadow of violence and death. Grant us your peace, and teach us to live in the dawn of your unfailing promise. O Lover of souls, when we wander far away, lead us back to You; when we refuse your embrace, do not give up on us; when we forget You, do not forget us. O Desire of every heart, the answer to every longing: You are the strong force that draws us into the mystery of love divine. Forgive us those things which distract and delay us, and lead us ever deeper into the Way, the Truth and the Life. God who has come, God who does come, God who is yet to come: Make us an Advent people, ready and alert to welcome and receive You in the stranger’s face, the loving act, the moment of grace, the presence of healing, the birth of possibility, the gift of wonder. Let every heart prepare You room. O Emmanuel, God-with-us, You show us the face of divinity and reveal the fullness of our humanity. Come: renew your creation, restore us all in Christ, and enable us to become who we are, your faithful and loving people. We pray in the name of Jesus. Amen.